Based on reviews from 81 experts and 12,509 users. 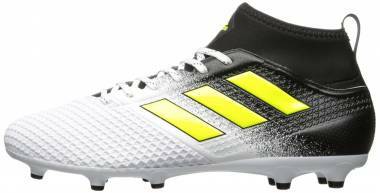 Learn how our rankings work or see our guide to white football boots. Updated Apr 2019. In an era when black was the most favored color, a game-changer historic moment evolved the football world into a colorful one. It happened in the 70’s when the England midfielder Alan Ball audaciously donned a pair of white Hummel cleats. Brian Hewitt was the mastermind of it all. As a sports businessman, his mission of bolstering Hummel sales happened significantly with that one bold move: painting Ball’s Adidas boots to white and deceitfully turned the boot to a Hummel. With that plot twist, a sky-rocketing 12,000 pairs were sold after the game. It is more than double than what they were earning back in 1970. That is the story of white football boots and how it all started. 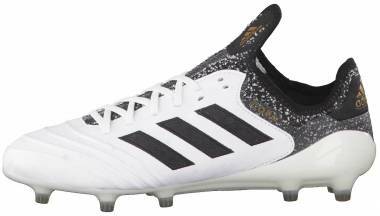 Several years have passed, and white remains as one of the most solid palette options for a football boot. Getting acquainted with this boot color by knowing its notable examples, advantages and other helpful information will provide us a more meaningful reason why it is worth a try. Below is a list of white football boots or boot collections coming from recognized international brands including Nike, Adidas, Puma, New Balance and Umbro. Some of the boots on the list are limited or special edition cleats. Nike Tiempo Legend Sergio Ramos edition - This white football boot is dubbed as “Corazon Y Sangre” which means heart and blood in Spanish. Only 4000 pairs of the player-themed cleats were initially distributed. The Nike Tiempo Legend VII boot was co-designed by the Spanish footballer Sergio Ramos, apparent with the personal symbols emblazoned on each side of the boot such as the text “Familia”. The pearly white palette was Sergio’s choice too. It is inspired by his love for white Andalusian horses. Nike Premier Triple White - As the name suggests, a pristine white silhouette covers the entire body of Nike’s heritage boot, the Premier. This football boot is a whiteout edition and was made public in 2016. A year after, the second version of Nike Premier was launched in black and blue color options. Nike Motion Blur - The Nike Magista Obra II FG and Tiempo Legend VI FG are the two of the boots in the Motion Blur pack that are dominantly white. The white color pack was derived from the legendary “Clash Pack” of 2012. The dual-tone silhouette features gradient transition of colors to create an illusion of speed. Nike Magista Opus 2017 - The remake of the Nike Magista Opus II from a heat map concept to a more dimpled textured upper was launched in a white colorway. Inspired by customer and player feedback, Nike revealed the dramatic revision of the Opus in April of 2017. Nike Revolution Pack - Among all the boots in the Revolution Pack, the Nike Tiempo Legend VI stands out in summit white and varsity blue colors. The two-toned design is intended to imitate the style of the 1987 Air Max 1 OG Line. The color pack is a celebratory tribute to the origin of Air Max. Nike Heritage Pack - The Nike Heritage pack, together with the Revolution Pack, was unveiled as a tribute style line to Air Max. The color pack is composed of indoor boots coming from Nike FootballX series. The Nike MagistaX Proximo II and TiempoX Proximo were both styled in white. As for TiempoX, the overall design is identical to the Nike Tiempo Legend VI of the Revolution Pack while the MagistaX is styled with an infrared heel and an ultramarine Swoosh. Nike CR7 Mercurial Superfly Vitorias - The Mercurial Superfly V Vitorias is a special player-themed boot that is created to honor Cristiano Ronaldo’s 4th Ballon d’Or Trophy. The boot’s design is inspired by the Portuguese label “Vitorias” which means victory. The glaring metallic golden plate matched to the pure platinum upper are noticeable elements that speak of Ronaldo’s prowess in football. Nike njr X Jordan Hypervenom - This boot is a collaborative Hypervenom II boot designed by two of the most prominent sports figures, Neymar Jr and Michael Jordan. It is inspired by Jordan V which happens to be Neymar’s favorite in the Jordan lineup. The boot’s focal point is the fighter planes shark teeth which can be found on the lateral and medial sides. The classic Jumpman logo is placed on the heel while the Brasil flag is on the laces. A few more symbolic images personal to Neymar and Jordan are found in the other areas of the boot including the sockliner and the packaging. Nike Radiant Reveal Pack - Nike released the Radiant Reveal pack in 2016 with white boot options in the Tiempo silo style. The white Tiempo boot is made available for both men and women with a similar looking design for each. The Tiempo boot for the women’s pack is a blend of blue and purple with a predominantly white upper. For the men’s option, a mixture of lime green and orange is in the soleplate while the upper is entirely white with a touch of black in the tongue area. Adidas Predator DB Capsule - Adidas consider this pack to be a “remastered” edition of the legendary Predator Accelerator which was originally released in 1998. The firm ground edition in the David Beckham series was referred to as the triple white “stadium” cleats. Meanwhile, the turf and lifestyle boots were tainted in red and black, respectively. The white DB Accelerator remake is stitched on the heel to mark Beckham’s shirt number in the past. The stitches and other details in the design were mostly Beckham’s choices. Adidas Dust Storm Pack - The Dust Storm pack is a four-silo collection that is predominantly white. Each boot in the colorway is fused with another color. A mixture of black and white is seen in the Nemeziz 17+ and the Ace 17+ firm ground. The other silos, the X17 FG and the Copa 17.1 FG are the two mainly greyish white ones with a blend of bluish accent colors. 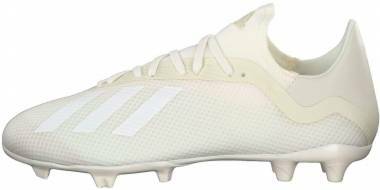 Adidas Predator Champagne Pack - Three staple Adidas silos and the 2017 remake of the Predator Mania were launched in a cream white base color with a champagne red accent. The colorway is derived from the original Predators that popularized David Beckham. Streaks of black are also added in the rubber padded forefoot of the Mania remake, the Adidas stripes of the Ace 17+ PureControl, the upper detailing of the X16+ Purechaos and the laces of the Copa 17.1. Adidas Ace 17.1 ANJA - This version of Ace 17.1 FG is the first ever limited edition for women. The colorway was inspired by the original ANJA which was launched in 1975 as a boot exclusively made for women. Its name was derived from the daughter of one of the designers. The K-leather upper of the remake boot carries a pearly white palette designed with black Adidas stripes and red heel liner. Adidas Copa Crowning Glory pack - This white football boot collection was launched to celebrate the iconic Copa Mundial’s 35th anniversary. The heritage boot is an all-time favorite line. It had been worn by several successful players such as Kaka and Franco Baresi. As a tribute, design details were symbolic of the success of the classical boot. The golden plate in a luxurious white upper represents the victories of the players who have sported the cleats. 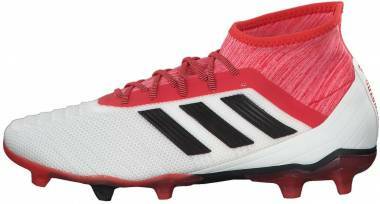 The boots included in this collection are the Copa 17.1 FG, Copa Tango 17.1 IN, and Copa Tango 17.2 ST.
Adidas Etch Pack - Designed to create a “pure” football boot, the Etch Pack was released in 2016. The collection is pure in a sense that the overall look is free of any ostentatious details. The minimalist style is apparent with the straightforward mainly white K-leather upper and the subtle golden artistic patterns on the sides. Both the Ace 16.1 and the X 15.1 carry these classy elements. Adidas Stellar Pack - The Stellar pack is another white-gold Adidas collection that was made available in 2016. The Ace 16+ Purecontrol and the X16+ Purechaos were the model boots of the special edition colorway. The white upper is etched with “stellar” details on both boots. The soleplate and other geometric patterns in the laceless boots are in a metallic gold vibe. Puma One Launch colorway - The original Puma One collection was released in a white-coral-black launch colorway in 2017. It featured a black Evoknit sock in a dominantly white Kangaroo leather upper. The collection was launched as a successor for Puma Evotouch and Evospeed. It includes Puma One 17.1 FG, 2 FG, and 17.3 FG. 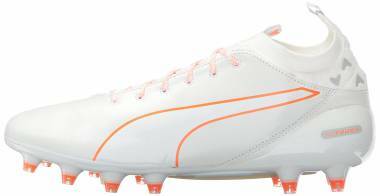 Puma Evospeed SL II K Whiteout - This white football boot was popularized as the lightest Kangaroo-leather cleats in the market when it was launched. It impressively weighs 142 grams. The boot is designed with an all-white upper with stitch detailing and the signature Formstrip. The soleplate is also white but with a mix of transparent studs. Puma EvoTouch White/Blue colorway - A mixture of white and blue make up the updated colorway of the EvoPro series. The refreshing color option was made available in 2016. The main color for the entire boot is white while blue is seen in the knitted sock and the Formstrip branding. The colorway was intended to produce a classic vibe to the Kangaroo-leather boot. Puma King Made in Italy edition - A special edition Puma King was released in 2016 as the “Made in Italy” version. The hand-crafted boot is designed with a mainly white upper with contrasting safety yellow studs. Intricate stitch detailing is seen throughout the upper of the heritage boot. Etched in the fold-over tongue is the phrase “Engineered in Italy” that is placed at the center of the Italian flag. A brown-blast red counterpart was unveiled together with this classic silo in commemoration of the legendary Puma King. New Balance Furon Apex- Limited Edition - Inspired by the fastest animal on earth, the New Balance Furon Apex was designed with Peregrine Falcon detailing in a predominantly white upper. The boot features a hybrid mesh upper designed for adaptive support and enhanced ball touch. It was headlined by Jesus Nava and Alvaro Negredo in 2016. New Balance Furon Whiteout - A minimalist whiteout style version of the New Balance Furon was made public in 2015 as part of their Winter-Fall collection. The clean-looking all-white silhouette features a textured upper and a black New Balance branding. New Balance Visaro Pro White Toxic - New Balance unveiled the whiteout version of the Visaro Pro Synthetic in 2016. Dubbed as the boot for the players who make chances, the Visa Pro was designed for the playmakers. It features a honey-comb synthetic upper in full white and a soleplate of toxic green. The K-leather variation of the Visaro Pro FG was released in a blackout colorway in the same collection. 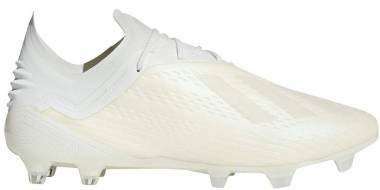 Umbro Speciali Eternal Whiteout - Two years after the original launch of the Speciali Eternal, a whiteout colorway was designed to reintroduce the cleats in a more refreshing way. The heritage leather boot is all about class in its entirely white upper with stitch detailing. With its transparent studs, it comes out as one of the clean-looking minimalist boot of 2017. Umbro Speciali Eternal Pepe Edition - The Portugal defender Pepe describes this white football boot as a dream come true. His aspirations as a football player are marked by the simple details of the signature version of the Speciali Eternal. The boot is an all-white rendition styled with red, green and yellow color accents, which are symbolic of the Portuguese flag. The heel area is stitched with Pepe’s signature on a red leather background. Umbro Medusae Pro White Carbon Gold - A triple-toned variant of the Medusae Pro featured magical themed elements including its tricky packaging. The boot’s main color is white while the gold and carbon palette is infused in the heel counter and stud tips, respectively. The boot was released in March of 2016. White football boots go with everything. White is considered to be an absence of colors. Due to this, it has been universally proven to match any other palette. When wearing white football boots, the risk of a fashion faux pas is very low. Any hue of jersey, socks or any football accessory will less likely be a mismatch due to its simplicity. So if you want to play it safe and still look nifty, go for white. 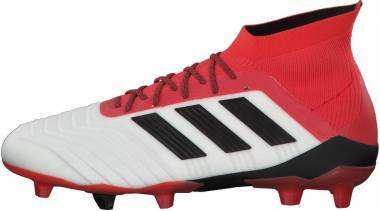 White football boots are favored by most professional footballers. In a study conducted by the Telegraph in 2014, the majority of football players in the Premier League prefer to wear white football boots. Green and Black, comes in second and third most preferred, respectively. If you want to look and feel like a pro, then white would be your best best. White makes football boots look more classic or more modern. White amplifies the visual aesthetics of a football boot. If it is paired with leather, it becomes even more classic. Meanwhile, if it is tainted in a synthetic boot, it will look even more modern. Whatever upper material the boot will have to offer, white will always accentuate its best qualities. White is proven to change player’s mood and concentration. Studies have proven that white can significantly improve concentration and calmness due to its light-reflecting characteristic. It is the same reason why some rooms are preferred to be painted with white. Dark colors can decrease the levels of the serotonin in the brain, which is responsible for mood regulation. So, if you’d like to get an extra boost of concentration and positivity in your football match, a pair white of football boot is the best way to go. One can’t argue that white football boots are hard to maintain in comparison to any other colors. However, it should not be a hindrance to choosing white as a color option. Given this, it will always be beneficial to know how to properly maintain and clean your white football boots effectively to make cleaning less tedious than expected. Always read the care label. Care labels are the tags inserted in the boot that will provide instructions on how to effectively wash and clean it. Sometimes, care labels come with the boot packaging. There may be general rules on how to clean a boot but reading the care label will prevent you from doing a procedure that will be detrimental to the boot’s material. Nowadays, boot manufacturers introduce new types of boot material from the upper to the soleplate and using general cleaning tips may not always work. Instructions on the care label are specific to the nature of the material used for the boot that will help make the cleaning process more efficient. Remove loose dirt from the boot before cleaning it. You can do it by gently knocking the boot together, so loose dirt will come off naturally. Doing this at the start of your cleaning regimen will make the next cleaning steps much easier and will save you more time. Leather and synthetic boots require different sets of cleaning materials. It is best to use a damp cloth to wipe off dirt from leather boots while a brush would come in handy for synthetic boots. A leather cream is recommended to maintain white leather soccer boots, while a detergent and lukewarm water will work best for synthetic materials. Dry the boots naturally. During the cleaning process remember to place newspapers inside the boot to keep it dry internally. Specific to white synthetic football boots, it is always best to keep them dry under the sun rather than using an electric dryer. The heat from the sun, so long as it is not extreme, can help lessen the stains and maintain its color. Do not use a washing machine in cleaning your white football boots unless it is specified on the care label. Materials such as leather are easily damaged if washed in a machine. Never use a wire brush when cleaning your boots. Its hard bristles can cause unwanted marks and damages to the boot material. Use a soft-bristled brush instead or a brush made of natural materials. Do not use a radiator when drying up your cleats. It will cause unlikely separation of adhesive in your boots such as in the sole. Do not forget to take off the laces of the boots before cleaning it. The laces should be washed separately to completely get rid of its stains from the end to end. 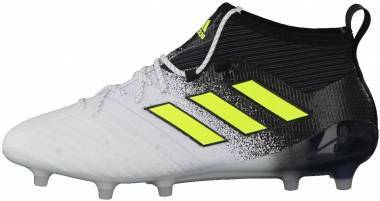 Are white football boots expensive? The color of a football cleat does not necessarily dictate its value. Generally, a boot becomes expensive if it contains more advanced shoe technologies. Another reason for a boot’s hefty price is if it is a limited or special edition. Do Nike and Adidas offer white football boots for women? Yes. 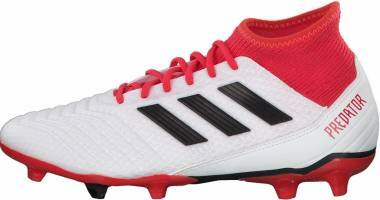 Football boot manufacturers such as Adidas and Nike offer white soccer shoes for women. 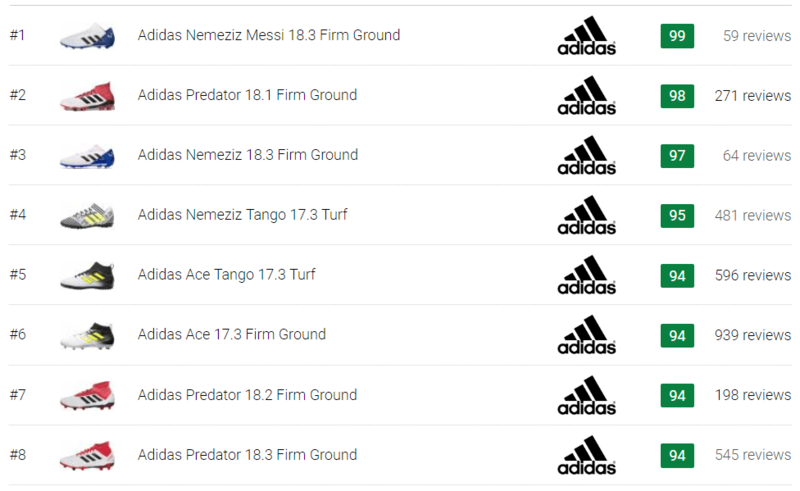 For Adidas, the Predator 18.1 FG for women is available in a white variation featuring Beige/Talc/Vapor Grey Metallic/Maroon colors. 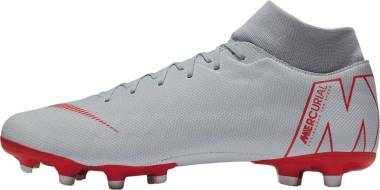 Nike also offers Mercurial Victory VI DF and Nike Tiempo Ligera 4 in white colorways. How to care for white leather soccer shoes? Caring for white leather boots requires regular maintenance to preserve its best quality. Nowadays, several products or home remedies are readily available to help you maintain your soccer boots by yourself. Expert service is always not necessary once you know some of the basic ways to keep your white leather boot’s pristine color and quality. Use toothpaste in removing stains from your white leather football boots. Apply it with a cloth or using a toothbrush. Use a white leather care kit. This kit contains a leather protectant that can maintain the leather quality and make it look good as new. It can be purchased from shoe stores and other online shops. Try using a nail polish remover for stubborn stains in your white leather boots. For white leather scratches, you can apply olive oil to the affected area then wipe it off using a dry cloth. How do I care for my white boot laces? You may use bleach when washing your white football boot laces. It’ll make your laces look good as new. It is also important to note that the laces should be washed separately from the boot. Some upper boot material may get damaged with bleach. How should I dry my white leather football boots after washing? After wiping the water off, let the shoe dry indoors but not in a small enclosed area. You may also let it dry outdoors but ensure not to expose it to extreme heat and sun. Sun and heat can cause leather shrinkage and color fading. Do not use artificial heat such as a blow dryer when drying up leather boots. It may cause damage to the leather surface.